Interactive game wall for loads of fun. 25 PVC balls included! Basketball hoop on the outside of the bouncer so more kids can play. 6 Neoprene Balls included! Features a large bouncer and slide. Up to 5 players at 100 lb each. Total of 7 players at a time when using the outside basketball hoop. The Double Shot Bouncer by KidWise is packed with loads of interactive games which are sure to keep your kids having fun all year long! 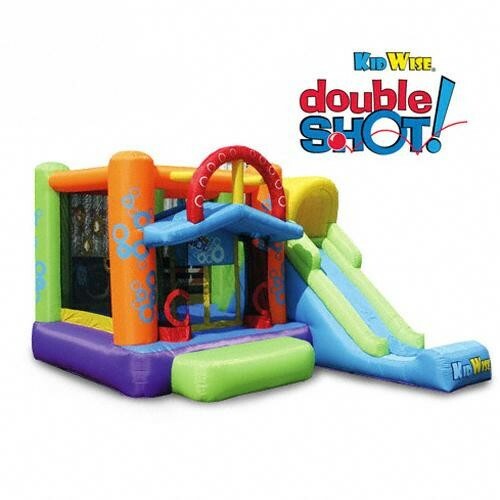 The Double Shot Inflatable Bounce House has play activities both inside and outside of the bouncer area. Which means a lot of activities for a lot of FUN! Your kids will be able to bounce around, throw PVC balls through the interactive game wall, climb the rock wall, play hoops, and slide down the slide. For the basketball game each player has their own net that gathers up to 10 balls each. Allows for 7 children to play at once when you include the outside basketball hoop game!